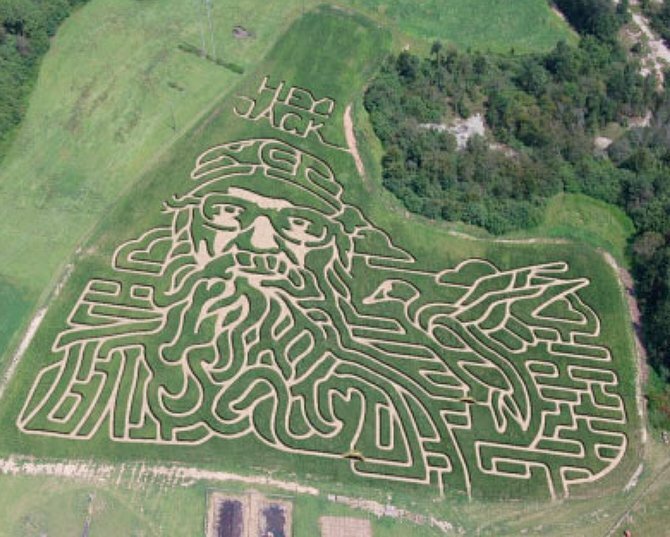 Misty and Lamar Duren, the owners of Corn Dawgs Corn Maze near Loganville, turned to Duck Dynasty when selecting this year’s design and have plowed their land to look like Si Robertson, complete with his iconic saying, “Hey Jack”. Misty and Lamar Duren are known for getting creative when selecting a design for the maze that draws thousands each fall. Last year the Georgia couple opted to feature then-retiring Braves player Chipper Jones. They had planned this year to go with the faces of four male stars of A&E’s hit show Duck Dynasty (Si, Phil, Jase and Willie Robertson), but realized that would be more difficult to plow than imagined, the Gwinnett Daily Post reports. “So we went with Si because he’s my favorite,” Misty Duren said. Winding through the maze takes about an hour and a half to two hours to complete, the Gwinnett Daily Post adds. The Corn Dawgs Corn Maze is open September 22 through November 3.